It was the rain that should have told us. High-altitude jets had flown over Aleppo the previous evening and, just occasionally, we heard their bombs exploding, far away in the countryside beyond the city. Then a soft, warm shower drifted over the ruins downtown and coated the streets and apartment blocks of western Aleppo with drizzle, and there was – for this city, at least – a strange silence. Dawn brought a brown, overcast sky through which no Russian or Syrian pilots could see the ground unless they chose to fly at low level through the downpour, which they never do. And that was when the bombardment of western Aleppo began. The mortars and shells broke across the city in a steady and growing rumble of sound that left only one question in our minds. Amid the ruins of eastern Aleppo, with its tens of thousands of trapped civilians, where on earth did its few thousand largely Islamist fighters, get all this ammunition? Syrian army long-range artillery, high on the hill behind the old Meridien hotel, banged away at the eastern horizon where smudges of grey smoke began to curl into the dun-coloured sky. It was not quite the storm of steel that the media – many in far-away Beirut – would have the world believe. 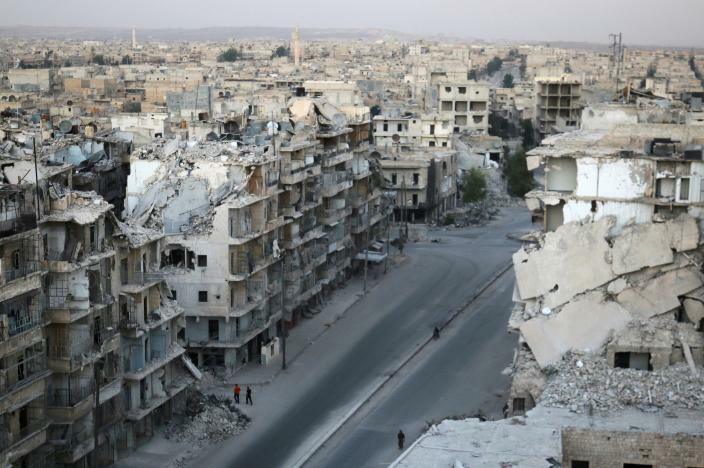 The battle for divided Aleppo has been fought for too long and its people besieged and then rebesieged – in both east and west – that the front lines have congealed into the square miles of dust and ruins that are now almost impassable. You might join the chorus of exaggeration about Srebrenica or Grozny, but Stalingrad this is not. Yet it shook both the civilians and the regime in the west of the city. Just after breakfast, as I was gazing eastwards through the rain towards the ancient citadel, there was a sudden clap of sound as a shell bashed into the governor’s modern office block. I saw bits of the side of the building flying into the air. The Aleppo governor, whose residence is itself sealed off by anti-car-bomb concrete barricades, was safe in Damascus where he was meeting Bashar al-Assad and other regional leaders. Others were not so fortunate. And this was the first indication anyone in the streets was given that the incoming fire was not only arriving from eastern Aleppo but from south-west of the city, from the fields and ruined factories and broken sewage farms where Nusra and some of its Islamist allies still hold territory that snakes all the way north to the Turkish frontier – from which weapons regularly arrive to increase this feast of violence. Wars inspire their own Hollywood version of reality and, in a darkened Ba’ath party headquarters with the rumble of explosions outside, I was to hear another rumour of war that will surely acquire its own mystique in the days to come. American planes had been seen dropping arms supplies into eastern Aleppo, Syrian jets had warned them off but some parachutes had been seen. “I think there is a video,” an otherwise extremely rational and intelligent official added. There was, of course, no video – there never is – nor are Syrian MiGs in any position to challenge US air power. Washington is not going to provoke Russia by sending its fighter-bombers from Turkey over Aleppo. Besides, given the American propensity for inaccuracy, any parachutes would surely have missed their target. Robert Fisk’s dismissal of claims that the U.S. was dropping arms supplies into eastern Aleppo calls into question his objectivity as a journalist. For we know from earlier reports that the U.S. and its allies are alleged to have supplied Syrian “opposition fighters” by parachute drops. For example last October Reuters was reporting that the U.S. was airdropping supplies to “Syrian rebels” in northern Syria. More recent reports allege that the U.S. was “considering arming” CIA backed fighters with anti-aircraft weapons. So why is Robert Fisk so quick to dismiss these claims without investigating them?